I’ve been using a DIY closed loop (OpenAPS) for 1,152 days. That’s over three years (from December 2014) of looping. That’s 1,152 nights of being able to sleep without worrying about dying in my sleep. That’s 1,152 mornings of getting to text my mom because – and when – I want to, not because it’s the thing that keeps her from worrying that I’m dead. It’s immeasurable peace of mind, in addition to the best outcomes I’ve ever had in 15 years of diabetes. And it’s gotten better since the very beginning. A reference design in plain language that explains the general approach and the safety constraints we have (hardware and software) that guide what we do in OpenAPS. The reference design still lives, and still guides the community. We’ve updated it now with the inclusion of supermicroboluses (aka oref1-related features), but most of it hasn’t changed and is the backbone of what and how and why we do things. Basic code that is modeled not after a fancy model, but the same math a person with diabetes does so that it is understandable and allows someone to learn to trust what the system is doing. We’ve stepped it up quite a bit over three years; adding features like autosensitivity to automatically calculate sensitivity changes in real-time; autotune to help tune pump settings; and things like unannounced meals to better adjust to real-world scenarios, etc. to the point where I’ve been no-bolus for several months. There are dozens of people who’ve contributed to help improving the code, from brainstorming and developing new features to testing and iterating. And the data shows that this model of development yields a system, which when used by individuals who build it themselves, can achieve outcomes beyond what is possible currently with commercial or in-development systems. Rigs that use a computer to hold the algorithm, a battery, and a radio stick. We’ve evolved from the original rigs that were Raspberry Pi-based with carelink sticks to Pi and Edison-based rigs with better radio sticks; and also smaller rigs. Now that Edison is discontinued, we’re migrating back to Pi (now that they’re smaller) rigs with screens on them for ease of use in offline scenarios. Documentation that’s open source and by the community, for the community. 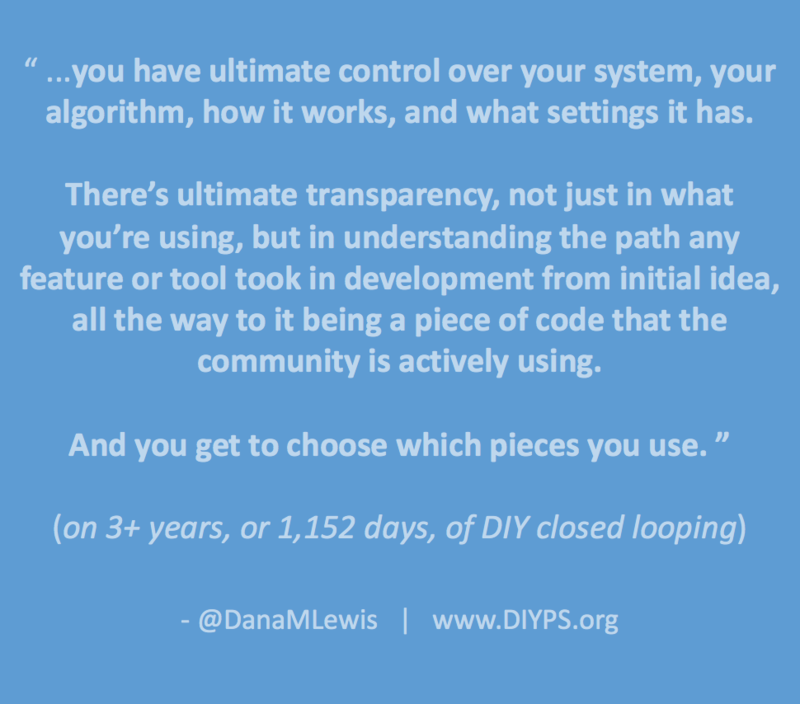 But what’s changed the most is the level of incredible detail available to allow anyone, regardless of background or previous experience, to build themselves a DIY closed loop system. There have been hundreds of contributors to the documentation. It is 100% do it yourself (aka, DIY). 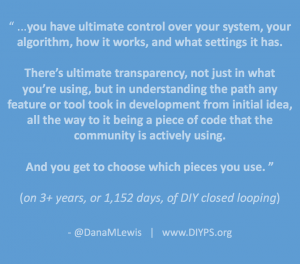 There’s no company or entity who will hand you a fully functional DIY closed loop. You get to build it yourself, which is why (among other reasons) comparing the costs of a DIY system to the cost of a potential commercial system is like apples and horseradish. But it also means you have ultimate control over your system, your algorithm, how it works, and what settings it has. There’s ultimate transparency, not just in what you’re using, but in understanding the path any feature or tool took in development from initial idea, all the way to it being a piece of code that the community is actively using. And you get to choose which pieces you use.